The man looked a little startled last night as he stepped out to greet his most devout followers in St Peter’s square, but Pope Francis seems like a normal guy. He refused to be elevated above the cardinals when addressing the crowd, and also broke with tradition by asking the multitudes to pray for him before blessing them. 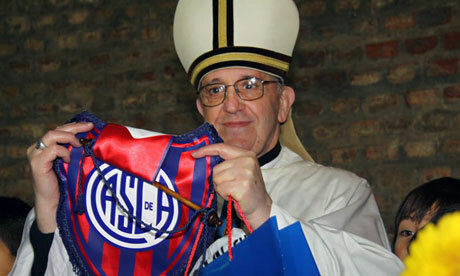 So here’s what we know about Jorge Mario Bergoglio, the man who yesterday, became Pope Francis. 1. He’s working class – one of five children and son of an immigrant railway worker and his wife. 2. He only has one lung – it had to be removed due to infection when he was just a teenager. 5. As the Bishop of Argentina he refused the usual trappings of the office and lived in a simple apartment, cooked his own meals and caught the bus to work every day. 8. In 2001 he washed and kissed the feet of AIDS patients in an Argentinian hospice. He has taken the name Francis in honor of Saint Francis of Assisi, who refused the wealth of his family and dedicated his life to serving the poor and sick.